The advent of micropubs had made the dream of opening a pub seem attainable. We understood that micropubs were places that focused on cask beer and had opened typically in converted empty high street retail units. But that was about all we knew, it was time to go and investigate. One Friday night in February 2017, we made Bexley our first port of call. A well-timed article on Deserter had alerted us to the fact that you could use the 51 bus to get to four of the borough’s five micropubs. We wanted to know how other people had approached them and to start to understand how we might go about it. A “scaled down village pub” was the closest we had come so far to describing our vision for the future. Armed with enthusiasm and some no doubt naive discussion points for the evening on design, layout and drinks offerings, Cal, Dave and I got off the train in DA14 and set off towards the Hoppers Hut. We weren’t entirely sure what the evening held for us, none of us had consciously been in a micropub before. Off a high street, about a 15 minute walk from the station, the first thing we noticed in the Hut was the peace. Appropriately Bez, running ahead of schedule on the first occasion any of us could recall, was reading a book. Undeterred, we set about the serious business of ordering some cask beer and taking in our surroundings. It was a pleasant setting with four cask beers on and a surprisingly large range of wines and ciders although ultimately, with its high chairs, modern light wood-panelled décor and bright lighting, it felt more like a wine bar than a pub. It was immediately apparent there were going to be many more takes on what a micropub was than we expected. Warming to our task and bored of waiting for the bus, we set off on foot back to the train station for the next place on our list, the Hackney Carriage. Kirsty and Phil clearly know their stuff, Location is king and—situated right outside the railway station at 7pm on a Friday night—it was packed. We found Stockers inside, thus completing our group, and attempted to analyse what made this place tick. The artificially lower ceiling, aided by what Bez described as “layered sound bumpfers” definitely helped keep the noise in and the more rambunctious crowd certainly lent more of a pub feel to the place. With another wide selection of drinks on offer, my understanding that they were only about cask beer was looking increasingly ridiculous. Being able to see the beer behind the bar was a pleasing novelty, as was the barrel Stockers had stationed himself at. In fact the barrel drew a surprisingly high amount of chat. I’d never considered their utility as a resting place for pints but by the time we left I’d convinced myself that no pub worthy of the name could ever go without them. The only thing we weren’t sure about were the signs warning people not to use their phone, a motif of many a micropub. Some rules, even if important, are better left unwritten perhaps. The next venue, the Broken Drum, was a short bus-ride away on the number 53. This was greeted enthusiastically by numerous inaccurate comparisons before we settled on it being a bit like the clubhouse of a village bowls club. This, for the avoidance of doubt, is a good thing. At the Drum I had a delicious pint of Hophead Mosaic for £3.20. The whip appeared to be stretching bafflingly far and we indulged in some high quality bar snacks—pork scratchings, crisps and nuts, very much the food of champions—with the change. By now we were in full flow about what we’d do with our own pub and the ideas were already ridiculous, an extended discussion about “heroes corner” (each of us allowed to put up pictures of everyday people we idolise who would then be entitled to free pints if they turned up) was interrupted by the arrival of a truly fantastic pub dog. The Broken Drum didn’t look much like we’d imagined and was quiet for the time on a Friday, but with the warm atmosphere and well-kept beer it had the basic ingredients of a great pub. 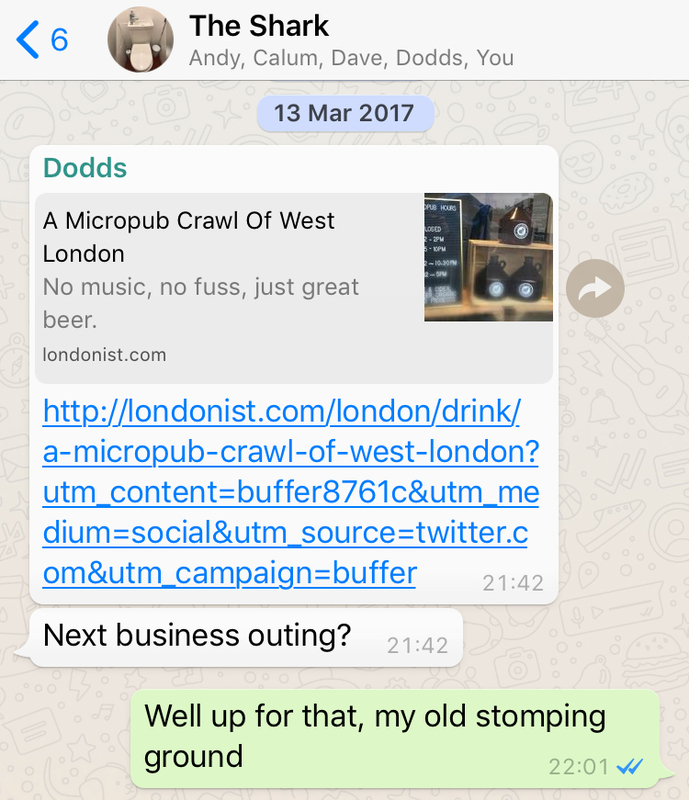 We kicked on towards the award-winning the Door Hinge via an app-based taxi service (sorry again bus, last orders were looming large). Apologies to the innocent stranger whose car I tried to get in under the misapprehension I’d reserved it. Arriving at the Door Hinge we immediately identified what all the fuss was about. The former taxi office was an unfussy setting, with low banquette-style seating that made the most of the space and a handful of visible and well-kept great beers at low prices. A load of mobile phones nailed to the wall demonstrated immediately that it takes the business of being a pub very seriously indeed. The atmosphere was balanced perfectly between intimidating and friendly. We loved it. With the serious(ish) stuff done with, we headed home via the retro-gaming bar Four Quarters in Peckham where Time Crisis II gleefully gobbled up the remaining whip. Drinks offerings: We will need to offer more than just cask beer. The Hackney Carriage had the best non-beer range of drinks and this seemed to draw more of a mixed crowd. We would possibly need to limit this: a small range of cider, wine and gin perhaps. Layout: The Door Hinge set up felt most like a pub, with the cosy seating and two small rooms rather than the single room of the other three. Of the four, this was probably the closest to our idea of what a micropub was and where we felt most comfortable. All the pubs served beer straight from the barrel which were located in coldrooms behind the bar. Design: Barrels are in; high chairs are out. Low ceilings help to keep the atmosphere in. Anything else: There were limited food options in all the pubs, a standard fayre of sausage rolls, pies and bar snacks appeared to be the order of the day. Our research continues at the opposite end of London with a trip to the Dodo in Hanwell and the Owl and Pussycat in Northfields, where we completely change our minds about what we want our pub to look like.